I’ve posted now to YouTube the full length “Walt Whitman, Radical Patriot”. Below you may find YouTube links. There is also an audio interview from KCBX radio that plays directly from this page. This play was first written and performed in 2004, as a free cultural event at the Santa Barbara Central Public Library. This filmed performance took place in 2005 at Victoria Hall Theatre, Santa Barbara, CA, due to generous support from Karuna Foundation and the Institute of World Culture. Special acknowledgment to Alison and Ernie Tamminga for videography and editing, and without whom there would be no living record of this event. Special thanks goes to fellow thespians Peter John Duda, Maria De La Vega Delgado, & James Colbert, who trusted me, and profoundly imbibed the exhilarating words and heart of a great American. 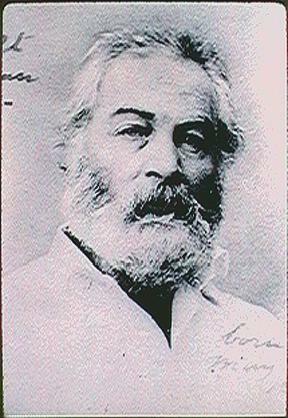 “Walt Whitman, Radical Patriot” was honored with a Santa Barbara Independent Theater Award in 2006. KCBX interview with Joseph Miller, hosted by Marisa Waddell: Central Coast Forum, October 19, 2005.
the American bard, coinciding with the sesquicentennial (2005) of the publication of “Leaves of Grass” (1855). Staged for four actors and multimedia, the play uses drama, humor, song, choral recitation , and movement to evoke Whitman’s great heart and sweeping vision. A collage of poetry and prose recitations is threaded together by a narrative line that follows his childhood, youth, artistic awakening, burst onto the literary scene, involvement in the Civil War (as a nurse), impressions of Lincoln, and broad views on faith. This entry was posted in Uncategorized, Video and tagged Institute of World Culture, James Colbert, Joseph Miller, Karuna Foundation, Leaves of Grass, Maria De La Vega Delgado, Peter John Duda, Victoria Hall Theatre, Walt Whitman Radical Patriot on February 12, 2017 by joemiller.